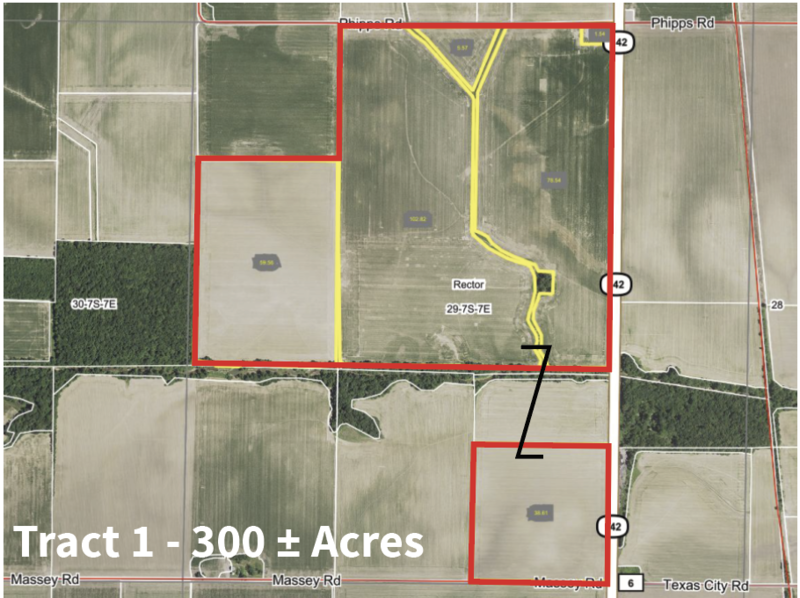 Prime Saline County, IL Cropland | Kurtz Auction & Realty Co.
Tract 1 Location: 12 miles northeast of Harrisburg, IL. From US HWY 45 in Eldorado, take HWY 142 north approximately 4 miles to tract 1 on the west side of HWY 142. Tract 2 Location: From tract 1 go north on HWY 142, 1/2 mile, then east on Douglass Rd. 2 miles. Watch for signs. TRACT 1: 300 +/- acre tract containing approximately 290 tillable acres. The predominate soil types are Karnak Silty Clay Loam, McGary Silty Clay Loam, Bonnie Silt Loam and Belknap Silt Loam. The Farm has Frontage along IL-142 (4,500’), Phipps Rd. (2,500’), and Massey Rd. (1,250’). TRACT 2: 80 +/- acre tract containing approximately 66 tillable acres. The predominant soil types are Colp Silt Loam and Patton Silty Clay Loam. The balance of this tract is 15 acres of woods/timber and offers excellent whitetail deer hunting. The tract has about 1,300 ft. of frontage on Douglass Rd. Terms: 10% down at the auction site at the conclusion of bidding. The balance is due with delivery of the deed by April 1st, 2019. Mineral Rights: All mineral rights owned by the Seller, if any, will be conveyed with the sale of the land. Evidence of Title: Seller agrees to furnish Bidders a preliminary title insurance commitment to review prior to the Auction. The Seller will furnish an owner’s title insurance policy. Seller agrees to provide merchantable title to the property subject to matters of record, general conditions of title and similar related matters. The Seller shall be responsible for paying all premiums associated with title insurance if title insurance is desired. All tracts are sold “AS IS”. Real Estate Taxes: The Seller will pay the Fall 2018 tax bill. The 2019 tax bill is the buyer’s responsibility. Closing: Shall occur by April 1st, 2019. Possession: Shall be granted to the successful bidder(s) at closing. Farming Rights: The property sells subject to the current tenant farmer’s contract for the 2019 farming year. The successful buyer shall receive the owners 40% share for 2019. 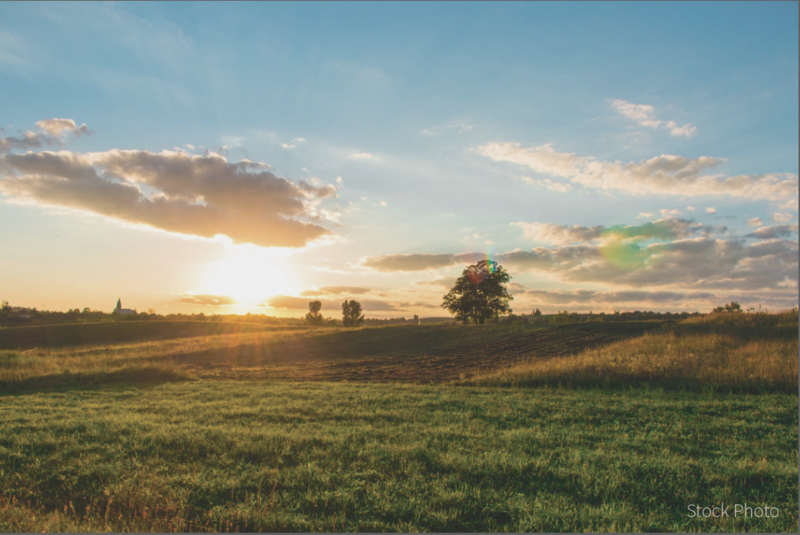 Acreage: All tract acreages and proposed boundaries are approximate and have been based off of legal descriptions, aerial maps, surveys and other documents.